Preschool Playbook: Cover Your Sneeze! Talking about spreading germs around is always fun--eeewww, but we do it anyway. On Thursday, we actually had some fun watching how our germs can spread to others. I had three little bean bag germs a nurse had given us a few years ago and we had lots of fun throwing them around as we sneezed and coughed. Then, I had made a little face and covered it with contact paper. I then attached the face to our easel. Next to the easel was a container of flour. I showed the children how when you sneezed your germs hit others, by demonstrating with the flour. They of course loved this. Just try to imagine will you, 12 little ones blowing flour around. I covered the floor, but didn't actually think about what would happen when they walked in the flour on the floor. If you do this be prepared for some mess. I even had paper towels to clean our person's face after each "germ invasion" but the paper towels were a little drippy when they cleaned it causing a bit of a cement reaction to various areas of flour. Mrs. T. did a great job of getting that all cleaned up. Thanks so much! Would I do this again? Probably, they had way too much fun to file it away just because of the mess. Our craft was very easy, it was just something quick to send home to remind them of what we talked about. They would have been happy as larks just blowing flour around all day. Each child got a paper plate that they drew a face on with marker. I traced their hand and cut it our for them. We got a tissue and placed it over their drawn face and stapled the hand and the tissue in that spot. We are concentrating coughing and sneezing in our elbow, but I didn't know how to draw the elbow. I figured since there was a tissue and we talked about throwing it away when they were done with it, it would be okay. when you cough and sneeze. I read one of my favorite books today. 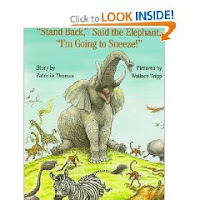 It's really just a silly book that I find a bit funny: "Stand Back," said the Elephant, "I'm Going to Sneeze! ", by Patricia Thomas. It's a cute story about an elephant that tries to warn all the other animals that he is going to sneeze and they must leave. Lots of bad things happen to the animals when the elephant sneezes. He doesn't sneeze, but do the animals really escape the wrath of elephant's sneeze? Let's keep our fingers crossed that this helps with those huge germ blasts! I LOVE LOVE LOVE this. Absolutely adorable and teaches a great message. Great way to illustrate how far a sneeze can go! This is so cool! You know you're brilliant, right? We've been practicing sneezing into our "chicken wings" all year, but I'm not sure they really get why we do it. I have a ton of extra contact paper just itching to get used and flour is cheap. Ha ha! I can't wait to try this. I LOVE sending kids home messy. What a terrific way to help children understand the concept of germs! great job!!! this really drives home the point! p.s. uh, that should say "KIDS"
I love this craft and have a suggestion. I am teaching our little gal to cough on her arm (forearm) as she's a mite too short/small to quite reach her elbow. That might be easier (and less confusing?) than the hand. Just a thought, love it regardless! Another great resource for teaching kids how to keep germs at bay - and wash their hands properly - is "The Art of Washing Hands" (http://artofwashinghands.com/). The site offers free posters, coloring pages and songs you can download and print out to use in the class room. Keep up the great work keeping kids healthy and having fun with learning!